Sunsets in Niamey were predictably beautiful, particularly in the months following the rainy season before so much dust obscured the atmosphere that the sun could lose itself in the haze. The near-desert air, tinged with sand particles, and cloud-free in the absence of reliable moisture, gave warm orange dusks while the sun itself showed its true colours as an orb of burning gas melting into the horizon. 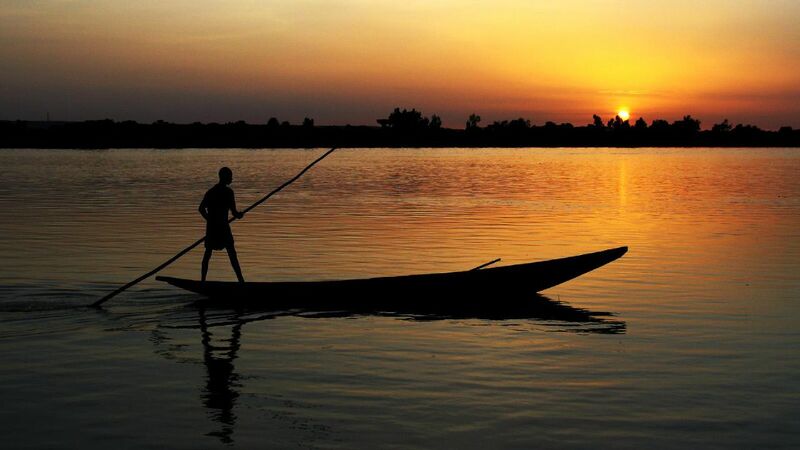 The Niger River runs north-south through the city, with the bulk of Niamey on the east bank, from where several vantage points gave stunning aspects of the sun going down behind the river itself. From atop the hill on which was perched the Grande Hotel, we would sit with dew-drops wrapped around our cold beers and nibble on barbecued meat on an open poolside deck watching the sun slip behind a low rise of plateau-like hills a few miles away. Better still, from our favourite little hideaway the Diamangou, an old riverboat-turned-restaurant moored on the eastern bank away from the city centre, we would feel the slow gait of the moored craft beneath us as we enjoyed leisurely drinks beneath strings of fairy lights, watching fishermen pole past in their little pirogues and batting at persistent mosquitoes. This photo was taken in September 2005, during an evening where most of our team had gathered in Niamey. Myself and several colleagues had spent most of our time in the border town of Maradi, close to Nigeria, which was where a large portion of our famine-relief activities were happening. Maradi was a hot, dusty and frenetic town, with little by way of entertainment and less by way of charm. By contrast, Niamey had excitements such as shops, restaurants and freshly-baked french bread that didn’t have the taste and texture of gritty dough. The fisherman in this picture presumably came from the nearby village, and spent a few minutes moving up and down the bank close to the riverboat, pushing the canoe along with his pole. I took a few shots of him, but this was by far my favourite, shot just as he framed himself in pose, balanced with the backlight of the sun setting. The quiet lap of slow-moving water against the boat, the plop of the pole in the water, the sound of voices drifting through the bushes from the nearby village, soft conversation and buzzing insects all leant the place an exotic peace. The air was warm, the beer was chilled, and the company was good. While there were a lot of times from Niger I would choose never to revisit, this particular riverside moment is one I continue to cherish. Updating a series of articles originally written as posts and now transfered over to the “Articles and Travel Writing” section of the site. This one about my time in Niamey, Niger. My time in Niamey was by parts exotic and dark. I came under tremendous pressure at work and, being young, struggled to deal with it well. My temper grew short, I overworked, lost my appetite, slept badly, and started over-exercising in an effort to manage my stress. In short, I toyed with the pointy end of burn-out. Driving has always been a form of escape for me. I like the physical act of being behind the wheel. I suppose if I unpack it it’s some combination of being in control of my surroundings, of being in a private space, and of moving or travelling (the last being something I will probably touch on elsewhere). The rains arrived last night. We’ve been waiting for weeks now, since early May, since the heat. The heat and the dust. You never really get away from it, though you can step into your air-conditioning, jump in the pool on a Sunday afternoon. Every time you step outside, the sun pounds your shoulders, takes your breath away. The dust gets everywhere, until you don’t really notice it, except when something ordinary and everyday takes on a fine orange hue, and you see the smudge-marks where your fingers disturb a fine layer of sand on your toilet seat, on the door-handle, on the screen of your computer. The fourth entry in a series of messages I wrote while living and working in West Africa’s Niger in 2005/6. Back in Niamey, and life has plateaued in something resembling normality. Six weeks ago, the Nigerien bureaucracy finally relented and gave me a provisional driver’s license (a month after submitting my original and at the start of a two-month wait for a proper license). The second post in a series I initially wrote while living and working in the West African nation of Niger in 2005/6. Niamey just before Christmas was, in its own way, not very Christmassy. It is very hard to get excited about trees draped with shiny plastic and fat men in red suits when perched on the edge of the biggest sandpit in the world (though then again the Aussies seem to manage it okay I suppose…) And yet it did have its own charm. The fairy lights strung up on the Total gas station glowed Bonne Annee 2006 in mishapen curves, and in the smokey, dust-filled air, car headlights and streetlamps cast an ethereal glow, like a cold winter’s fog in south-east England. If you stand still and concentrate hard, it almost feels atmospheric, and for a brief moment, you get a little nostalgic. Then you realise that it’s getting hard to breath, and it’s still 30 degrees at 8pm, and the muzzazin starts yelling his call to prayer down a nearby microphone, and Christmas flees. We went to Agadez, because really there was nothing else to do over Christmas in Niger.